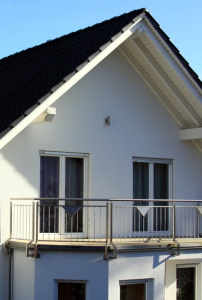 They are constructed on the basis of a window frame, either standard or wider, and intended for use in flats, and balcony entrances in houses where it is not possible, or not necessary, to enter from the outside. A certain modification to this type of door is the implementation of a low aluminium threshold, thus creating no obstacle for children and prams or wheelchair users etc. The door handle is installed on the inside only. 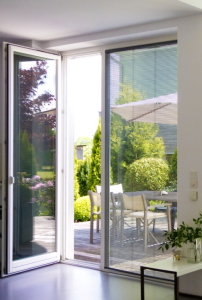 A mini hand grip and a door handle with a blocking system are useful accessories for this kind of balcony doors. The first allows the door to be left ajar from the outside; the latter allows the door to be blocked in a given position. A half-way solution between balcony and terrace (entrance) doors are wide-wing balcony doors with door handles on both sides and a lock. The terrace door is simply a door variation constructed analogically to the entrance door (with a low threshold, robust hinges by Dr. Hahn, a three-point door bolt, interlocked with a handle, a possible addition of a second lock and safety locking devices, and also, most importantly, two opening patterns: inward, like a balcony door and outward, like an entrance door).